Leaving home to go market shopping this morning the first thing I saw was a guy in a top coat, hat, gloves and scarf. It's the end of May, what's going on. Ten minutes later I passed a plucky London girl in shorts. That's more like it, the summer wardrobe is out and it's staying out. I don't know about you but, chill or no chill, I've had enough of steaming hot porridge breakfasts for a while. Yet oats are so good for you. From its humble origins as a cheap stomach-filler, its status has risen to 'superfood' level with reports that oats are good for everything from lowering blood pressure and cholesterol to increasing brainpower and libido. So, rather than abandon it entirely in the "heat" of summer, why not tweak it with the seasons. Used as a base for seasonal fruits and nuts you can vary it throughout the year and make the most of our outstanding home-grown fruits. 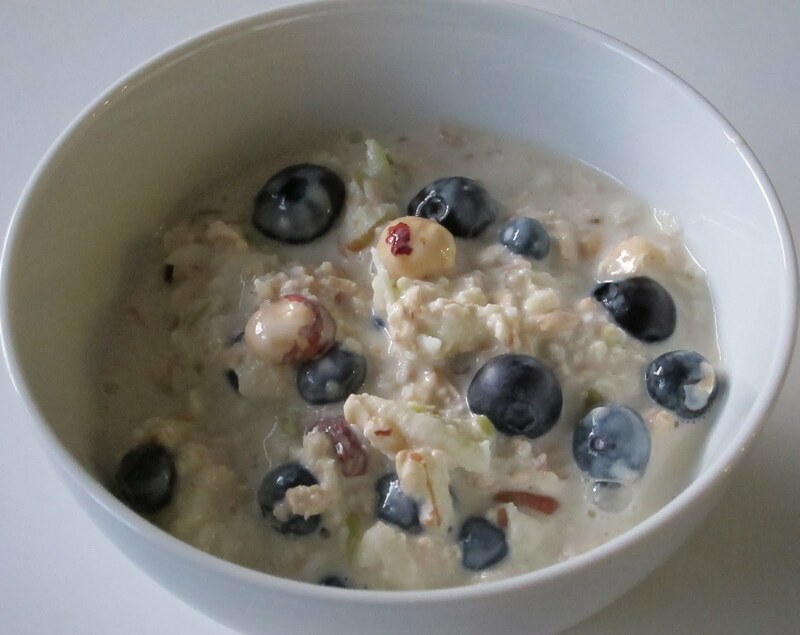 The original "Bircher" Muesli, on which this dish is based, was introduced by the Swiss Dr Bircher-Benner as a nutritious dish for his patients. The recipe contains oats soaked in water, grated apple, lemon juice, a little cream and a few hazelnuts or almonds. I've been served this for breakfast in Berlin and it's very nice if a little worthy, and, like porridge, I can see it could become a bit boring. To ring the changes, I soak the oats (rolled oats are best and the mix can be kept in the fridge for up to 3 days) in apple juice or milk instead of water, use yoghurt instead of cream, and add seasonal fruits as well as nuts. Fruits can be changed to reflect seasonality from spring to late autumn - raspberries, blueberries and blackberries work best but strawberries, rhubarb compote or sliced apricots ring the changes. In the winter months, raisins or sultanas are good soaked for a few hours in apple juice. As for the nuts, for me hazelnuts are the best choice but in summer their sweet, milky cousin Kent Cobnuts are delicious, or try almonds. I also add a little honey to counteract any acidity in the fruit, the amount will vary depending on which fruit you choose. Here is my basic recipe. It's not only good for you but moreish rather than worthy. Soak the oats with the milk or juice overnight or for at least 2 hours. 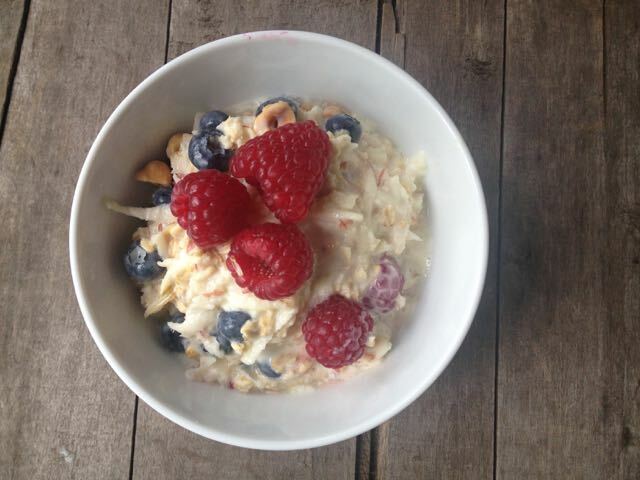 To your soaked oats, add yoghurt, grated apple, lemon juice, honey and nuts and stir to combine. Fold in the fruit and serve.